It has been 3 weeks since dad came to stay with us now. I have been reading a lot about Alzheimer’s and music is mentioned just about everywhere for therapeutic uses. 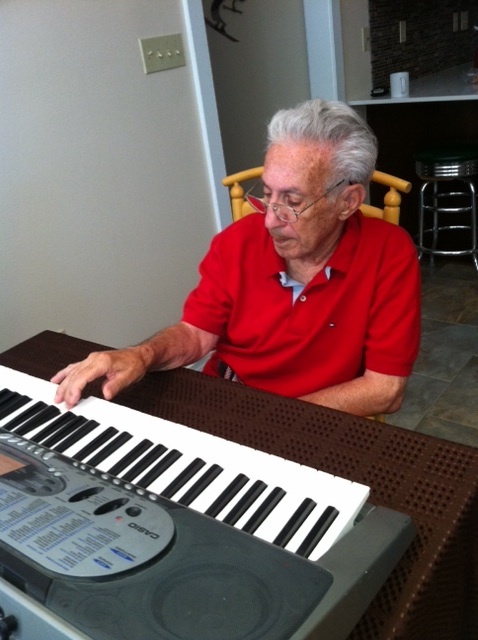 Dad is doing amazingly well and I have found, when he has a down moment, music can change his mood miraculously. He may not remember my name at the moment, but put on a Frank Sinatra song and his foot starts tapping to the beat and he either hums or sings the words he knows by heart. I have been using Direct TV’s stations of his era – Big Band, Soda Shop etc… with Bluetooth headphones or I made him a great Rat Pack Pandora station he listens to while I work at my computer (need to buy desk speakers ASAP). He even sang God Bless America a few times since he got here and dazzled his audiences – he still knows all the words and sings in tune. Today, I took a risk and pulled out the keyboard and he started playing some songs on request. The problem is that I have to request as his memory will not pull them up otherwise. He was as happy as can be tapping at that keyboard. As he keeps gaining weight and getting stronger, there is no question I will get him into the groove of listening to live music locally – which he has always enjoyed! By the way, my dad was a very accomplished musician. He left high school early with his GED, grew facial hair and started working at night clubs at a very young age. He played in Miami Beach when he started out and moved back to Boston. His main instrument was the trumpet, but he also plays piano, accordion, a lot of others and was quite the singer too. He had his own bands in the Boston area called “Sherman Marcus Orchestras” and played just about every wedding (lots of Jewish ones), Bar Mitzvah, political and who’s who events in the city. Now on top of all this, he is pretty deaf now and wears hearing aids, but I know he can hear a lot better than I ever gave him credit for. A couple of years ago we were at the French Quarter Festival and he commented that the band that was playing hurt his ears because it was out of tune. A few minutes later, the lead singer stopped the set and said sorry, we have to do some tuning before we continue! And on a strange small world note – my hubby grew up 40 minutes away from me in Natick, MA – but we met in Florida. My dad was also a music teacher at Natick High before my husband ever got there. Had to throw that in! So yes….music music and more music. As I write this, he is behind me with the headphones on, tapping, humming and coloring as happy as can be! Geaux Sherm! I wish you the best taking care of your dad. Playing music sounds like it was a great idea. Hopefully, others will benefit from your sharing this. Thanks! Thank you E.J. I hope so too! Greta, your dad did graduate from HS. Have his Yearbook on shelf. He grew a mustache at 15 yo so he would look older in order to work in an area of Boston called Sculley Square which today would probably be considered a Red Light District – with bars, strippers & other such entertainment. He got to know some strippers who became big names.